Solutions for business, industry, sports etc. The generator of the EA11 VILHELM þORSTEINSSON, a catching and processing Vessel of Samherji HF, is overloaded during certain manoeuvres of the main drives that are mostly run at 400 V / 50 Hz or 450 V / 60 Hz. The voltage cannot be kept in a suitable range. A 5.67 or 8.3% detuned reactor power factor correction system, which can be operated with 400 V / 50 Hz or 450 V / 60 Hz. 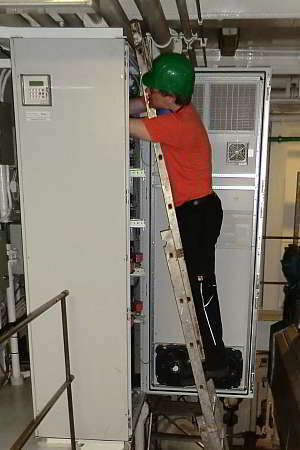 The unit with a total power of 1200 kVAr is controlled in 24 steps. 600 kVAr are dynamically operated with a thyristor switch, the remaining 600 kVAr are operated conventionally using a contactor. In order to cope with the special system and load conditions as well as the operation through 2 voltage and 2 frequency ranges a special software was developed for the reactive power controller. For further information refer to "Quick load changes" or "Products". From engineering to commissioning: One of our development engineers makes final adjustments during a harbour manoeuvre and boots the system. 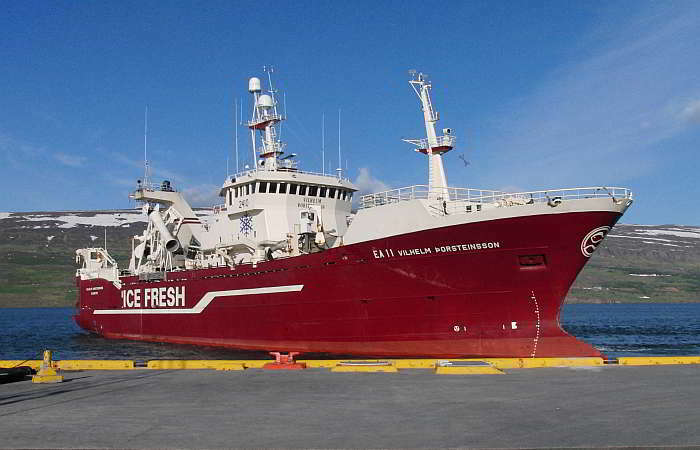 50,000 t of fish worth 3.3 billion Icelandic crowns per year, with a crew of 34.